Alviso Marina County Park is located at the southern end of San Francisco Bay along Alviso Slough adjacent to the salt ponds and marshes of Don Edwards San Francisco Bay National Wildlife Refuge (Refuge). Alviso Slough meanders its way through the salt marshes of the Refuge and from the park, it is approximately four miles to the open waters of San Francisco Bay. 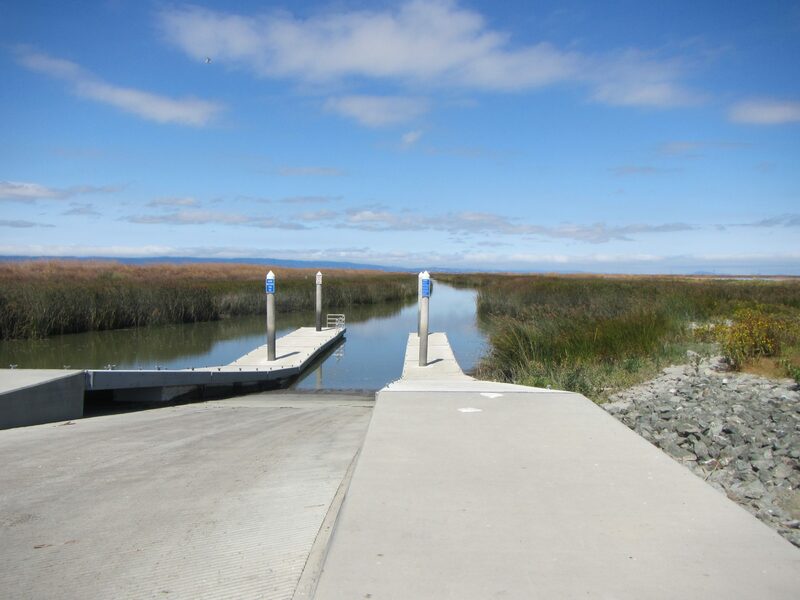 The boat launch ramp provides one of the few clear routes in the San Jose area through the salt marshes out to the open waters of San Francisco Bay. 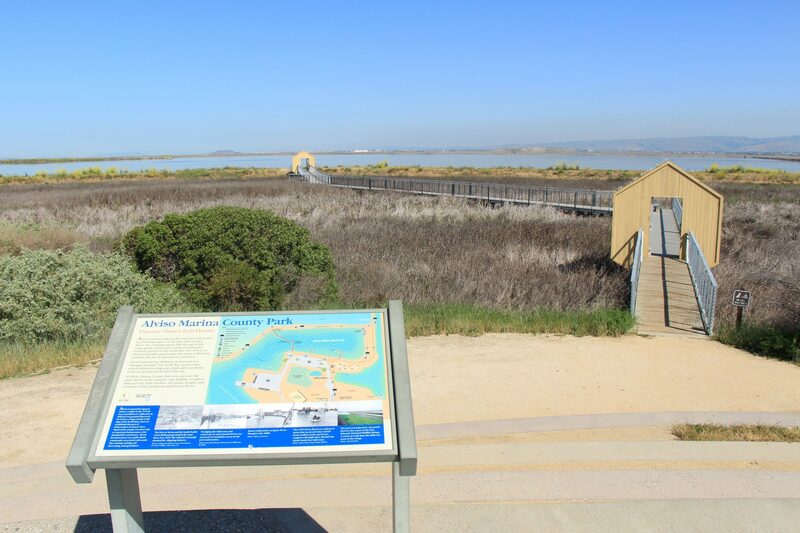 The park offers a great variety of recreational opportunities within its boundaries and leads visitors to the Refuge for bird watching, hiking along the pathways, boardwalks, and on regional trails including the San Francisco Bay Trail. The park offers sweeping views of the mountains surrounding the Bay and of the wildlife that use these ponds as their home. There are endangered species that live in and around the Refuge, so please keep a respectful distance from wildlife and respect the sensitive nature of this unique ecosystem. There are two concrete boat launch ramps and two floating docks. One of the docks is high-freeboard and the other is low-freeboard. There is a rigging area and a boat washing spigot. Motorized and non-motorized boats both use the launch. The 18.9 acre park is owned and managed by the County of Santa Clara Parks and Recreation Department (“Santa Clara County Parks”). 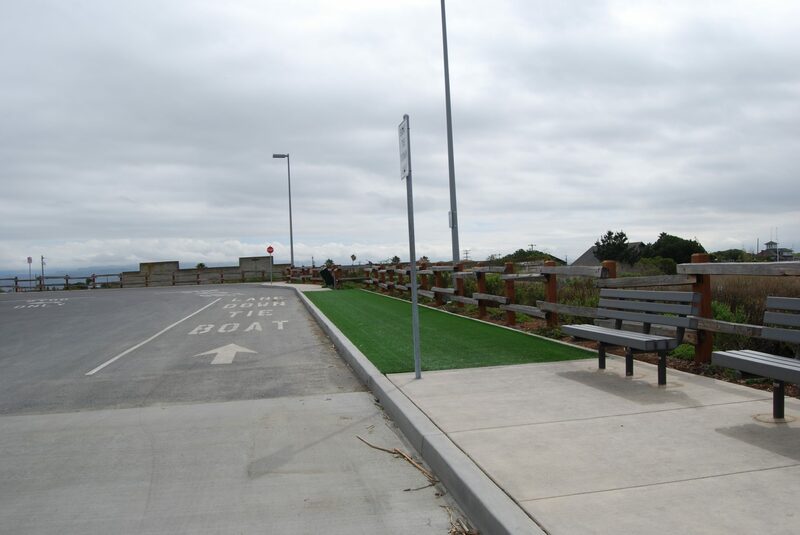 The park is located at Mill Street, Alviso (City of San Jose). Santa Clara Valley Transit Authority bus route #58 stops near the park. Take Highway 237 (Alviso-Milpitas Road) west to North First Street exit. Turn right on North First Street (which becomes North Taylor); turn right on Gold Street, left on Elizabeth Street and right on Hope Street. Take Highway 237 (Mt. View-Alviso Road) east to Great America Parkway exit. Turn left onto Great America Parkway, turn right on Gold Street connector, left on Gold Street, left on Elizabeth Street and right on Hope Street. 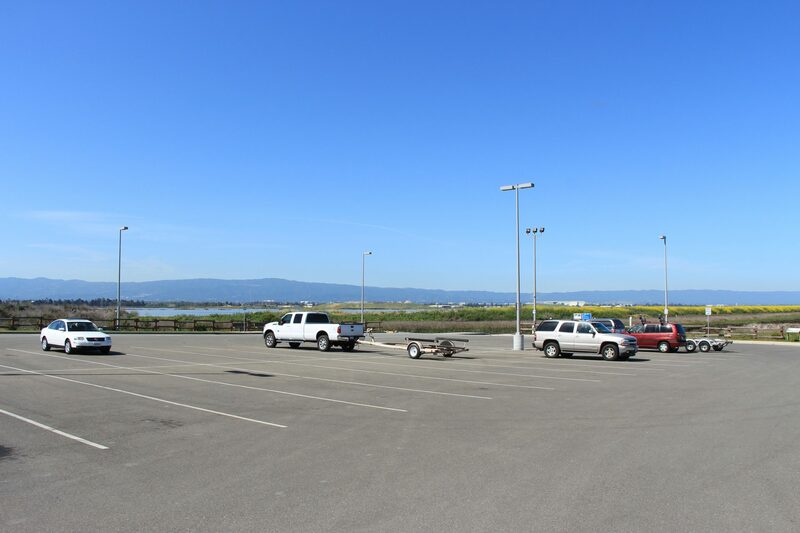 There are two parking lots in the park, including one near the launch facility with boat-trailer-sized parking spaces. Parking is free with no time limits during regular park hours. 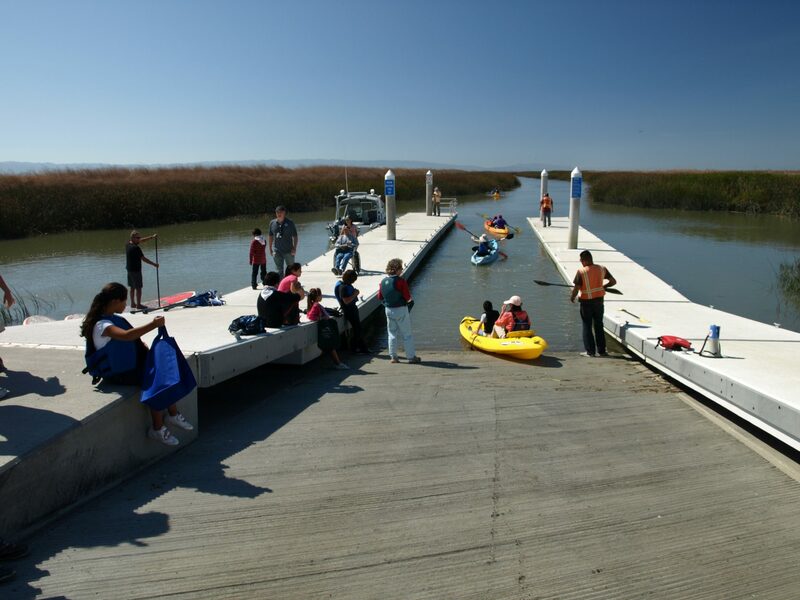 Alviso Marina County Park is open year-round from 8:00 a.m. to sunset. 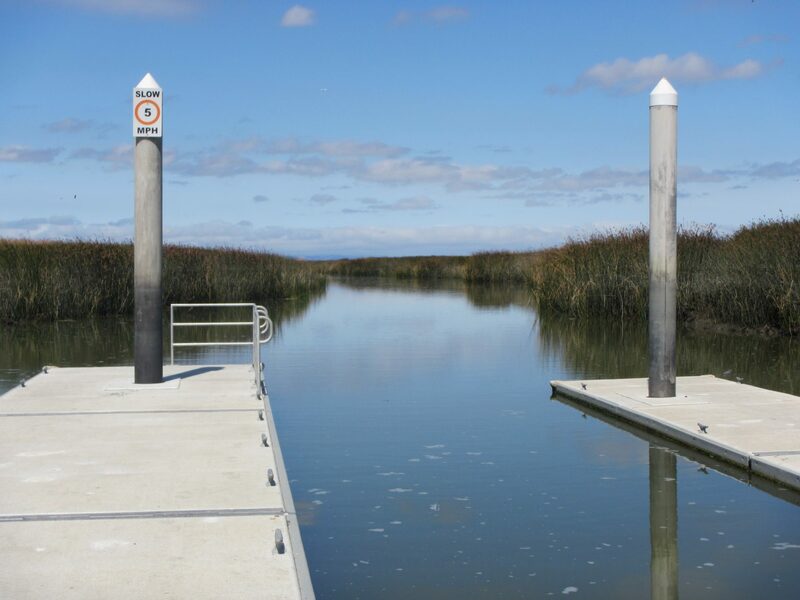 Santa Clara County Parks has a special permit program for vessel owners to access the launch ramp outside of park hours (8:00 AM to sunset) for the sole purpose of launching or retrieving a vessel at the park. Overnight parking is not allowed. Those interested in launching or retrieving vessels outside of park hours will need to purchase an annual Gate Key which includes a parking tag from the Parks and Recreation Department. Visit Santa Clara County Park website for more information about the application and fee. 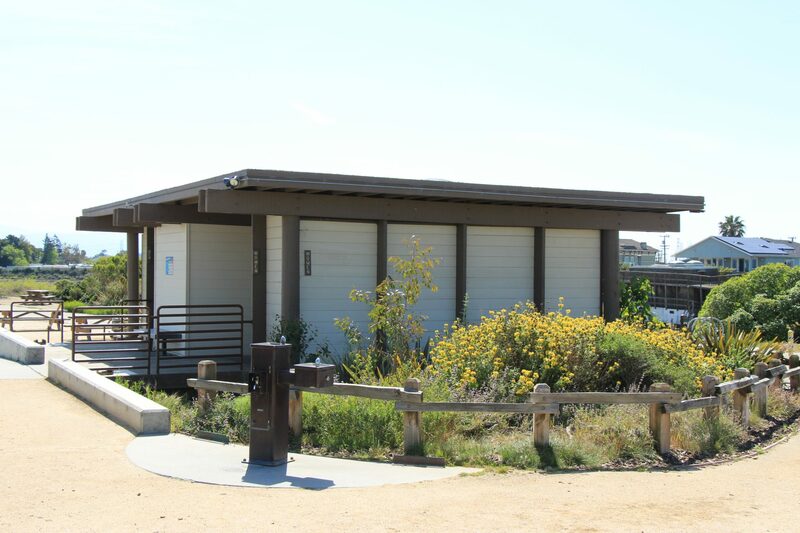 The restroom (ADA-accessible) is located near the entrance to the park and has flush toilets. Amenities at the park include picnic tables, BBQs, drinking fountain, benches, boat rigging and washing area with washing spigot (no hose provided), and safety and informational signs such as tide charts, and interpretive signs. The path of travel from the parking lot to the launch is flat and paved. The slope of the boarding piers (the docks located next to the boat ramp) changes with the tide, but is generally level at higher tides. The distance from the closest ADA parking space to the launch is approximately 110 feet. The ADA accessible restroom is located in the lot closest to the entrance. The boat washing and rigging areas are accessible from the launch and parking area. There is an accessible picnic table and accessible drinking fountain near the restrooms and entrance to the park. The park is located along one of the longest continuous stretches of the San Francisco Bay Trail and is also on the National Park Service Juan Bautista de Anza National Historic Trail. Trails around the salt ponds in the adjacent Wildlife Refuge can be accessed from the park. Mudflats become exposed during low tides which can cause boaters to get stranded.  There is a tide chart and other boater safety information located on the information bulletin board near the launch ramp to assist boaters in planning their trip. Navigational charts can be obtained through NOAA’s website or a local retailer (Ref. No. 18AHA18651). Seasonal hunting is allowed within the Refuge, generally from October through January. Check the Refuge website or call 510 792-0222 for current hunting information. This area provides critical habitat for migratory birds as well as resident species. The slough is a nursery for many fish, bird, and mammal species including these sensitive species: leopard shark, salt marsh harvest mouse, harbor seal, Ridgway’s rail, and steelhead. Please observe buffer distances, do not disturb or harass wildlife, and do not land on levees, wetlands, or Refuge land (Refuge property surrounds Alviso Slough). The endangered Ridgway’s rail is found in the marshes surrounding Alviso Slough. Ridgway’s rails become vulnerable to predation during high tide events when they seek refuge in higher ground. The Water Trail recommends boaters maintain a buffer distance of 50 feet from Ridgway’s rail habitat and not enter channels that are less than 100 feet wide, particularly during high tide events. Pacific harbor seals are the only marine mammal resident in the Bay year-round. Harbor seals tend to use the same terrestrial sites year after year, called “haul-out sites.” Research has shown that harbor seals using haul-out sites are sensitive to disturbance by humans. The Marine Mammal Protection Act requires a distance of 300 feet from marine mammals, but the Water Trail recommends keeping a distance of approximately 500 feet from a harbor seal haul-out during the pupping season (March – July). To help you visualize what these distances mean, 100 feet is approximately the distance of six sea kayaks. Keep an eye out for the annual Day on the Bay Festival usually held in October in the Park. The festival is a fun event with food booths, arts and crafts, live entertainment, and kayak trips. Alviso has several nearby restaurants within walking distance of the park and nearby hotels.